The QX200 AutoDG Droplet Digital PCR System provides absolute quantification of target DNA or RNA molecules for EvaGreen and probe-based Droplet Digital PCR (ddPCR™) applications. The Automated Droplet Generator simplifies the ddPCR workflow, making digital PCR both scalable and practical. 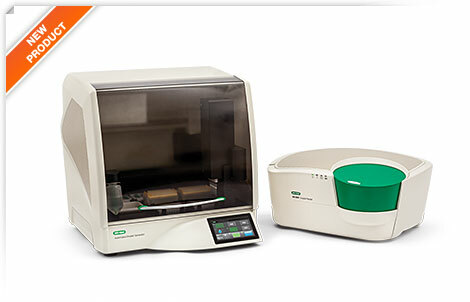 The AutoDG Instrument eliminates user-to-user variability, allowing you to fully exploit the precision of ddPCR technology by providing more consistent droplet counts across users and plates. The AutoDG Instrument also minimizes hands-on time — it takes less than 5 minutes to load the instrument, and no supervision or user activity is required during droplet generation. Cancer biomarker studies and copy number variation — measure varying degrees of cancer mutations, detect rare DNA target copies, and resolve copy number variation states with superior sensitivity and resolution. Predesigned, wet-lab validated PrimePCR™ ddPCR™ Assays are now available for mutation and copy number detection. The QX200 AutoDG Droplet Digital PCR System requires the use of the C1000 Touch™ Thermal Cycler with 96–Deep Well Reaction Module and the PX1™ PCR Plate Sealer.